Todd Bentley “fires up” South Korea. Well Todd Bentley is in South Korea. Many are flocking for what signs and wonders they can get and sure enough he is giving it to them. 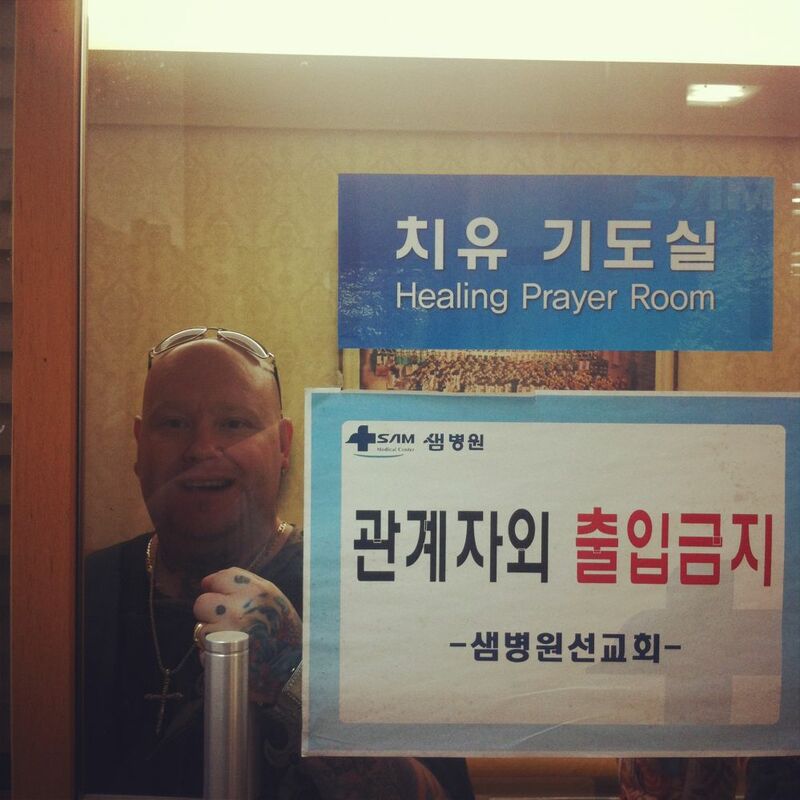 From his latest update he even got a healing prayer room. One enthusiast he prayed for got “baptized in the holy spirit and said she felt Jesus for the first time”. Todd Bentley and the Fresh Fire team had the incredible opportunity to hold a meeting at a cancer treatment center in Seoul, South Korea. The president of the center invited Todd to come and share about supernatural healing and pray for all those with terminal cancer. This was an amazing time in the Lord as they prayed to impart healing to over 100 patients with terminal cancer, some who had been told they had only a couple days to live. We are expecting reports of healing and look forward to sharing these testimonies with you as we receive them. There’s never a quiet day when Todd Bentley comes to town. “Feeling Jesus” sure sounds rather esoteric but I still hope he atleast mentioned Christ’s death on the cross to propitiate (a sacrifice that appeases) God’s wrath against sin. Dear Todd, the message from the suffering Christians in North Korea is the same as the prayer from other Christians from South Korea and all over the world, “preach the cross and Christ crucified for sin”…No biker boots and no other ‘gospel’. Todd Bentley Florida Revival Antics (biker boots, baseball bats and all). Do you think John the Baptist was weird looking? He even ate locusts! The Bible calls us a peculiar people. Some are more worried about what people will think about them then what Jesus thinks of them. That’s true concerning the weird look part. However, do you think that perhaps Bentley’s theology is well, problematic and unbiblical? Why are you soooo jealous of Todd Bentley? God uses him and YOU can’t stand it! Praise God the revival will go on regardless of all the nay sayers. I bet you wouldn’t have liked to see Jesus pray for the sick and be healed either!! !